However, according to reports from the scene there were no injuries as a result. According to reports the accident occurred sometime after 10 am today and it happened in the vicinity of the Police Station in West End. This news site will post further details on the accident as they become available. I recognize the bumper which is still there! so much for picking up trash. I tend to agree. whose bumper and why isn't it picked up? I hope the driver is OK. I don't know the driver or how the accident happened, but I was passing by and saw the vehicle. It is clear that the reef condition in that particular spot prevented this accident from being worse and that's why the vehicle hasn't submerged. If it was fatal, the comments would have been different. The BVI is full of hilarious ppl. Got some good laughs here. However, the bigger picture here is that we don't have any fatalities. 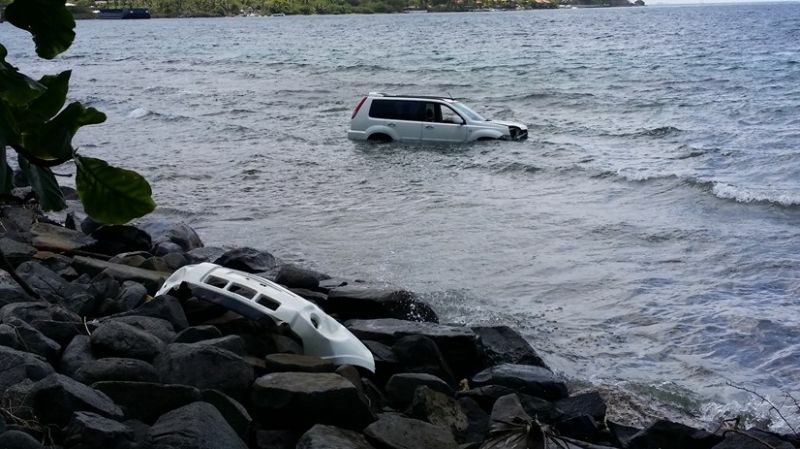 Bcuz its an "Off Road" vehicle doesn't mean you can take it into the sea. lol, glad no one got hurt. I believe he was either trying to over take someone or trying to avoid one of the many pot holes on the roads, or the brakes maybe give out. there are many questions as to how this accident accured< but only the driver(male/female) knows the truth. I glad that he/she is ok and we dont have another road fatality on our hands. that accident accure in the same spot where the late Maxwell Smith died 2 or 3 yrs back. This driver deposit is dead!! I visit Tortola very frequently and from what I observe some people drive too fast. The road is a winding one and the island is relatively small. You will eventually get to where you are going. Slow down !! he probably texting an drivin or goin too fast, we drivers here bad man. They were trying to avoid the new departure and re entry tax by swimming there and back.